← Community Enrichment Centers Provide New Opportunities. Folks unfamiliar with the fine art of shopping for their vegetables in the forestry department might find it unlikely that there is a simple elegance to be found in among the sticks and foliage. But, with a little imagination, you can become a Master Chef in your own kitchen. Try these eggs on for size. Add a little dehydrated Violet leaves and Turmeric to the yolk filling (Salad Dressing and yolks) and a fresh violet on top with a green olive slice. We like a lot of paprika but, put on as much or as little as you like. If you don’t like green olives, try black olives, or a sprig of basil. Be creative. 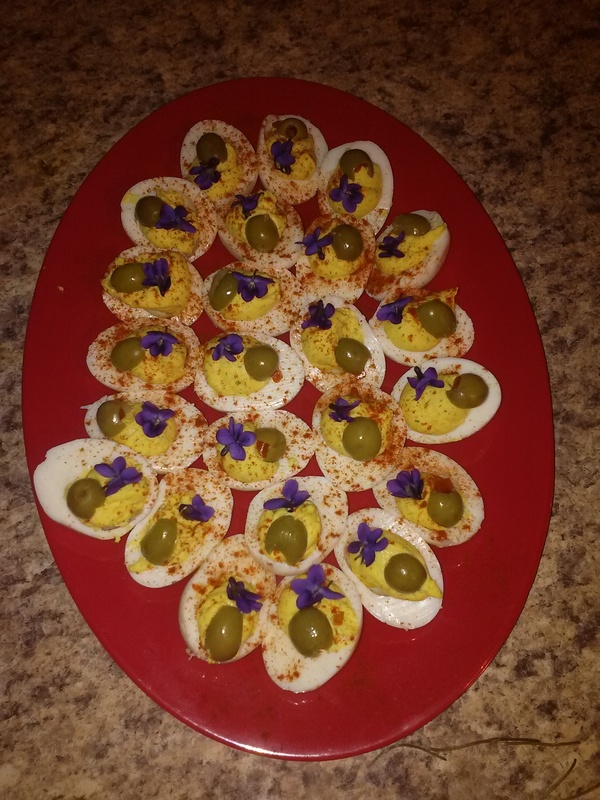 It was Easter so we expelled the devil and renamed these delights Jesus Eggs. Not everything coming out of Nature is rustic and hard to swallow. There are many many attractive, delicious and nutritious wild edibles that our greatest chefs covet. Morel Mushrooms and Ramps might be the most notable, but there are supermarkets full of deliciousness to be had. Wild Raspberries and Strawberries, Dandelion greens and Stinging Nettle are a very few. Nettle doesn’t sound elegant does it? But picture this…wild Rainbow Trout served along side steamed Stinging Nettle (they can’t sting you then) with a salad of Wild Lettuce, Lambs Quarters, Wood Sorrel topped with Ramp flakes. Drizzle a Wild Strawberry vinaigrette over…everything…yum. What’s more elegant than that? This entry was posted in Nature's Access News, Wild Edibles. Bookmark the permalink.